The stars of the hit MTV show and movie franchise Jackass, have teamed up with Dakar Rally winner and Australian motorcycle legend Toby Price to try out Slideways Go Karting Gold Coast’s three storey indoor kart track, as preparation for this weekend’s Castrol Gold Coast 600 ramps up. Jason ‘Wee Man’ Acuna, Chris ‘Party Boy’ Pontius, Preston Lacy and Dave England were all in fine form, with the group set to take the Club 600 stage (behind the Supercars pit lane) on Sunday between 12:45pm and 1:15pm with their Filthy Seppo Tour. It promises to be a mix of stand-up comedy, stunts, stories and insults, and if their efforts at Slideways are anything to by, it is one show not to be missed! “I was told by the people that work here that I have the best form,” England told the Supercars website. “At home I have an off road go-kart so I have an advantage. I have a little dirt track in my yard so we have a little mini motorcycles and off road go karts, quads … anything with wheels. For price, the 2016 Dakar Rally victor, the chance to race with the Jackass crew provided many laugh out loud moments! This weekend, Price gets back behind the wheel of a Stadium Super Truck, as the series returns for their second tilt through the concrete canyon of Surfers Paradise. “I like doing new and different things, kind of keeps it exciting and keeps the adrenalin going,” Price told Supercars.com. Remember, you can get free public transport to the Gold Coast 600, with details on how to get to Slideways Go Karting Gold Coast at 10 Spencer Road in Nerang available on the Translink website. 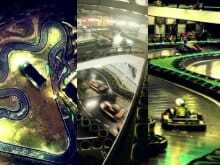 Slideways Go Karting Gold Coast is open 7 days a week, 10am – 10pm, with bookings available by phoning (07) 5596 3663. Photos of Jackass and Toby Price at Slideways can be found on our Facebook page.